Yamaha RX-V3067 review | What Hi-Fi? You're spoiled for input choice with the RX-V3067. There's a grand total of eight 3D-compatible HDMI inputs, alongside which you'll find twin HDMI outputs. Both outputs are also ARC-enabled (Audio Return Channel) so you can feed sound from your TV's HDMI input to the amp (provided it's ARC-compatble too). The Yamaha is DLNA-certified and ethernet-equipped so you can connect to your home network and stream files, such as WAV, FLAC and AAC from a PC. You can also access a host of internet radio stations. Many design cues have been taken from Yamaha's top-of-the-range DSP-Z11. Power amps have been laid out symmetrically, the frame for the chassis is formed in an ‘H' shape for increased rigidity. Yamaha's YPAO automatic speaker calibration system now features Reflected Sound Control (RSC). It's the most high-tech version of YPAO to date (also found on the RX-V2067) and can now compensate for the material on your walls and floor, together with awkward speaker positioning and any objects between speakers and listener. 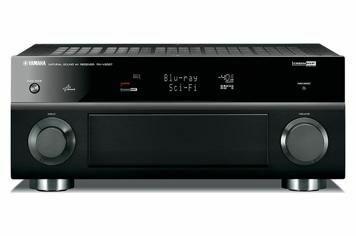 Besides majoring in surround sound processing, Yamaha incorporates HQV's picture processing technology in the RX-V3067. This gives you extensive control over various aspects of picture when using the amp to upconvert or upscale incoming video signals. There are motion adaptive, edge adaptive and de-interlacing settings, together with detail, contrast and edge enhancements. The Yamaha is one of the more competent amps when it comes to picture processing. Feed in a standard definition 576i signal and out comes a stable, detailed, watchable 1080p picture. But surround sound is the amp's primary function, and the Yamaha puts in an accomplished performance. Compared with the RX-V2067, you get a much grander, larger-scale sound for the money. The amp shows impressive explosive power as the A-Team attempt to evade unmanned drones, with the explosions sounding weighty and full-bodied. Rockets fly between front and rear channels, flanking and immersing the listener. Dialogue has a rich tone that would be a perfect fillip for any speaker systems with bright or harsh sonic tendencies. The Yamaha though, can't match the very best in terms of outright detail and dynamics – amps such as Pioneer's VSX-LX53 also communicate soundtracks more clearly. Otherwise, this Yamaha is a very solid, dependable performer that's extremely easygoing and easy to live with.